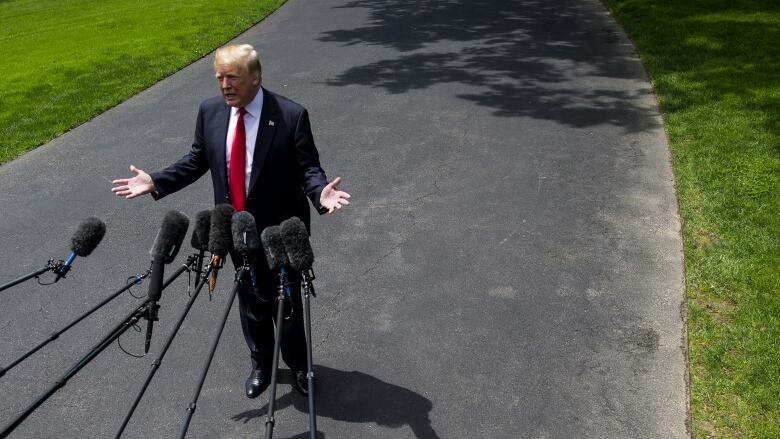 Trump threatens tariffs of up to 25% on all cars imported into U.S.
U.S. President Donald Trump is mulling slapping tariffs of up to 25 per cent on all vehicles imported into the United States, throwing a wrench into negotiations for a new North American free trade deal. The Commerce Department said Wednesday that the administration was considering imposing tariffs on all imported vehicles, under little-used section 232 of the Trade Expansion Act of 1962. It's the same weapon the administration wielded in imposing tariffs on steel and aluminum earlier this year. The clause gives the U.S. president the power to impose tariffs on just about any foreign product if the White House deems they would "threaten to impair the national security." Canada and Mexico are poised to lose their exemptions to those tariffs in less than a week unless a new deal can be reached by June 1. A person familiar with the discussions said the president has suggested seeking new tariffs of 20 to 25 per cent on automobile imports. The person spoke on condition of anonymity and was not authorized to speak about private deliberations. Autoworkers union Unifor said it welcomed the new NAFTA negotiations as a chance to discuss critical issues in the industry, but it doesn't like how the White House is using section 232 as a "blunt trade weapon." "As a trusted trading partner, I think it's clear that Canada is not a threat to American security," Unifor national president Jerry Dias said in a news release. "What's unclear is the motivation or the actual target of potential tariffs," Dias said, suggesting the White House is trying to use "section 232 as a political tool to deliver one of [Trump's] so-called wins in the absence of a new NAFTA prior to the U.S. midterm elections." Scotiabank economist Derek Holt said the tariff threat is yet another sign of instability in the global economy, created by an administration that seems bent on tearing up the old rules. "This is the behaviour of a volatile, personality-led emerging market, not a first world nation, let alone a superpower," Holt said. "As if we were not already there, one has to very fundamentally doubt the stability of the U.S. as a partner in global commerce and the value of its signatures on international agreements ranging from the WTO to NAFTA to the Paris accord and the TPP, among others." The move is the latest salvo in Trump's escalating trade war against foreign powers who he insists are taking advantage of trade deals and treating the U.S. unfairly. "Mexico has been very difficult to deal with. Canada has been very difficult to deal with," Trump said Wednesday. "But I will tell you that in the end we win," he said of ongoing North American Free Trade Agreement negotiations. "We will win, and we'll win big." At the time, Trump hinted at some big news to come for the U.S. auto sector that would make workers "very happy." Hours later, the tariff plan was floated. Negotiations on the auto industry have reportedly been a major sticking point in NAFTA talks, as U.S. negotiators have pitched a very rigid definition of what is an American made car. Canadian and Mexican negotiators, meanwhile, have pushed for a definition that allows for a certain percentage of foreign made components or assembly services. Daniel Ujczo, a trade lawyer with Dickinson Wright PLLC, said the tariff threat is likely meant to pressure Mexico into accepting U.S. demands for NAFTA changes that would shift more auto production to the U.S. from Mexico. But he questioned whether it would work. What do Trump's tariffs and Ferris Bueller have in common? Anyone? Anyone? "I do not believe that it will have the desired effect," Ujczo said. "Everyone knows that [the WTO investigation] will take too long and has no chance of surviving any legal challenge." But Canada and Mexico are not the only targets of the tariff threat. About half of all vehicles sold in the U.S. are imported, especially high end vehicles, where European automakers BMW, Daimler and Volkswagen together have a more than 90 per cent share of the market. BMW's biggest manufacturing facility in the world is in Spartanburg, S.C., and more than 70 per cent of BMW's U.S.-made cars are exported. Together, German carmakers produced 804,000 cars at local factories in the United States and exported 657,000 German-made cars into North America last year, according to German auto industry association VDA. But they have also hiked their production in Mexico by almost 50 per cent last year, while U.S. production has shrunk slightly. Winners and losers of the looming trade war between China and the U.S.